The Cold War (1947–1991) was the tense relationship between the United States (and its allies), and the Soviet Union (the USSR and its allies) between the end of World War II and the demise of the Soviet Union. Most of the countries on one side were allied in NATO whose most powerful country was the United States. Most of the countries on the other side were allied in the Warsaw Pact whose most powerful country was the Soviet Union. The Western-Capitalist group of countries includes Western Europe, the Americas, Turkey, Israel, Japan, South Korea, Thailand, Iran (1945-1979), Pakistan, Malaysia, Philippines, South Africa, Australia and New Zealand. The Eastern-Socialist group includes Eastern Europe, Soviet Union, Angola, Ethiopia, Cuba (1959-1991), Mongolia, North Korea, China and Vietnam. The start of the Cold War in 1947 was due to a belief that all governments would become either communist or capitalist. The Western allies feared that the Soviet Union would use force to expand its influence in Europe, and was especially concerned that Soviet agents had obtained information on making the Atom Bomb after the war. Both groups of nations had opposed Nazi Germany. The Soviet Union had sporadically co-operated with Germany and shared in the division of Poland in 1939, but Germany turned against the Soviet Union in June 1941 with Operation Barbarossa. After WWII, Germany was left in ruins. 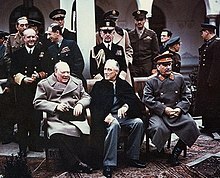 The victorious Allies that occupied it split it into four parts. One part was given to the United Kingdom, one part to France, one part to the United States, and the eastern part was occupied by the USSR. The city of Berlin was also partitioned among the four parties even though the USSR had conquered it. 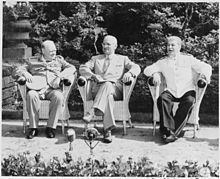 Winston Churchill, Harry S. Truman and Joseph Stalin at the Potsdam Conference, mid-1945. The Federal Republic of Germany (Bundesrepublik Deutschland or BRD) was recognized by the Western allies in June 1949. From April 1948 to May 1949, the Soviets blockaded West Berlin, which led to the Berlin Airlift. The USSR named their section of Germany the German Democratic Republic (Deutsche Demokratische Republik or DDR) later in 1949. The western parts of Berlin were called West Berlin, inside the DDR. The Berlin wall built in 1961 divided the two parts of Berlin and was part of the iron curtain that divided Europe. Espionage, "spying" has been around for a long time, and was very important during the Cold War. After its successful nuclear espionage in the Manhattan Project the USSR built up its spy organs, especially the KGB. The Central Intelligence Agency led US efforts abroad, while the FBI did counterespionage. Catching foreign spies was among KGB functions, as well as fighting domestic subversion. In the USSR, the dictator Joseph Stalin died and Nikolai Bulganin and Nikita Khrushchev (1953) took his place. Khrushchev later took sole control of the USSR. Khrushchev's Secret Speech marked a period of de-Stalinization and Khrushchev tried to undo many of the things Stalin did (such as the Gulag prison camps and 'cult of personality'). In the United States, there was a "Red Scare", and when the USSR detonated its own atom bomb, there was a great deal of political fallout. Famous people, in many fields who had been Communist sympathizers in the past lost their positions. Many actors were 'blacklisted' and were not hired to act in movies, ruining their careers. Senator Joseph McCarthy accused some important Americans of being communists, including some high government officials. The 1950s were the beginning of the space race between the United States and USSR. It began with the USSR putting the Sputnik satellite into orbit around the Earth, making the Soviet Union the first country in space. The United States responded by starting NASA, and soon sent up its own satellites. The Soviet Union also sent the first man (Yuri Gagarin) into Earth orbit, claiming that this proved communism was the better ideology. 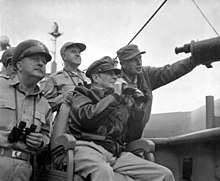 In the 1950s, the United States (under president Dwight Eisenhower) created a policy called "New Look," cutting defense spending and increasing the number of nuclear weapons as a deterrent in order to prevent the Soviet Union from attacking the USA. The USSR also increased their nuclear force, resulting in mutual assured destruction. In the Suez Crisis of 1956, the Cold War alliances were broken for the first time with the Soviet Union and United States favouring one side, and Britain and France the other. Later that year, the Western allies did not interfere when Soviet troops suppressed an anti-communist revolution in Hungary. United States Vice-President Richard Nixon engaged in several talks with Nikita Khrushchev during the 1950s. One of these was the 1959 "Kitchen Debate" in a model kitchen in Moscow. These debates highlighted the political and economic differences between the USA and the USSR. The following year, the United States U-2 spy plane crashed in the Soviet Union. Tensions between the two countries increased. After the United States tried to invade Cuba and failed (Bay of Pigs), the Soviet Union attempted to supply Cuba with nuclear missiles. These missiles in Cuba would have allowed the Soviet Union to effectively target almost the entire United States. In response the United States sent a large number of ships to blockade Cuba thus preventing the Soviet Union from delivering these weapons. The United States and Soviet Union came to agreement that the Soviet Union would no longer give nuclear weapons to Cuba as long as the United States does not invade Cuba again. This was the highest period of tension during the Cold War and it was the closest the world came to a nuclear war, with possible global conflict to follow. After the agreement that ended the Cuban Missile Crisis, relations between the two sides eased up. 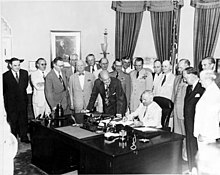 Several treaties, designed to reduce the number of nuclear weapons, were signed. During this period of Détente, the United States began building a good relationship with China, a previous ally of Russia. Reagan speaks at the Berlin Wall's Brandenburg Gate, inspiring Gorbachev to "tear down this wall"
The policy of détente ended in 1981, when the U.S. president Ronald Reagan ordered a massive military massing to challenge the Soviet Union's influence around the world. The United States began to support anti-communists all over the world with money and weapons. The idea was to help them overthrow their communist governments. The Soviet Union had a slow economy during this decade because military spending was at an all-time high. They tried to keep up with the United States in military spending, but could not. In the Soviet war in Afghanistan starting in 1979, the Soviet Union had a difficult time fighting resistance groups, some of them armed and trained by the United States. The Soviet Union's failed invasion of Afghanistan is often compared to the United States' failure during the Vietnam War. In the late 1980s the new Soviet President Mikhail Gorbachev made an effort to make an ally of the United States to fix world problems caused by the war, with the ultimate aim of eliminating nuclear weapons completely. However, this did not take place because the President of the United States, Ronald Reagan, insisted on having a nuclear missile defense system. The people of the Soviet Union were divided on their feelings about this. Some wanted President Gorbachev to fight harder to eliminate nuclear weapons, while others did not want him to be talking to the United States at all. These mixed feelings created an atmosphere of political in-fighting, and the people were no longer united behind one goal. Because of this, the Communist Party started to crumble. ↑ Walker, Martin. 1995. The Cold War: a history. ↑ "Cold War Museum". www.coldwar.org. Retrieved 2018-05-14. ↑ Pike, John. "Cold War". www.globalsecurity.org. Retrieved 2018-05-14. This page was last changed on 10 April 2019, at 14:11.